Strong plan will create jobs, fight pollution, and protect climate. British Columbia’s forthcoming clean growth strategy represents a must-seize opportunity for the province to secure a prosperous, low-carbon future. Fortunately, the government’s first clean growth intentions papers give us reason to be optimistic that this fall’s strategy will deliver strong action to protect our communities and set up our economy for success in the changing world. However, the task of reining in our climate-damaging carbon pollution must not be underestimated. Ten years ago, with the introduction of B.C.’s first Climate Action Plan, we saw emissions reductions between 2008 and 2011, and B.C. was seen as a climate champion. Since 2012, with many climate policies stalled or repealed, our carbon pollution began rising again. We must be bold to make up for lost time. The province’s intentions papers on the building, transportation, and industrial sectors put forth some policies that, if adopted, will be among the boldest in Canada and North America. That being said, the proposed actions address only a portion of B.C.’s carbon pollution sources. Therefore, we look forward to announcements of further actions to address other emissions sources in the coming months, and expect them to contain a similar level of ambition. In response to the Clean, Efficient Buildings intentions paper, the Pembina Institute recommends B.C. set a target for carbon pollution from homes and buildings to be reduced by 50% to 60% by 2030 (as suggested by the government’s Climate Leadership Team and Climate Solutions and Clean Growth Advisory Council). Carbon pollution from buildings should be virtually eliminated by 2050. To meet these goals, the province must ensure new buildings are energy-efficient and heated by low-carbon fuels, such as renewable electricity, renewable natural gas, or renewable district energy systems. B.C. also needs a low-carbon retrofit strategy — to upgrade 30,000 houses, 17,000 apartment units, and 3 million square feet of commercial space every year between now and 2050. Making our homes and workplaces energy-efficient, healthy, safe, and affordable is the next mega-project for B.C. — one that calls for private and public investment of up to $1 billion per year. This could create more than 10,000 sustainable jobs across the province and generate $4–8 billion in economic growth. Meanwhile, the ability to monitor our progress and adjust our plans as needed over time are critical to ensuring successful implementation of the clean growth strategy. B.C. already has some key monitoring and reporting mechanisms in place or forthcoming, including 10-year emissions targets, a commitment to introduce sectoral targets, and legislated requirements for biennial progress reports. The government should build upon these tools with carbon budgeting by sector; detailed, publicly released plans for achieving B.C.’s carbon budget; independent verification of progress; and the evaluation of policies and projects with regard to their impact on the carbon budget. British Columbians have much to gain from investing in the clean economy. The construction and upgrading of low-carbon buildings, the development of technology to help us use energy wisely, and the provision of low-carbon solutions to industry will create many jobs across the province. Clean innovation is good for the climate and good for business. So let’s get to work on making B.C. a climate leader again. 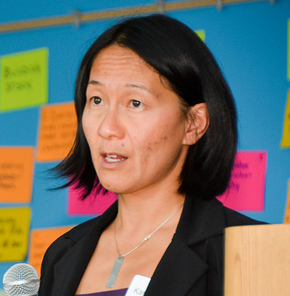 Karen Tam Wu is the B.C. managing director at the Pembina Institute and a member of B.C.’s Climate Solutions and Clean Growth Advisory Council.